Regular members of the congregation usually have a service time that they consistently attend every Sunday. 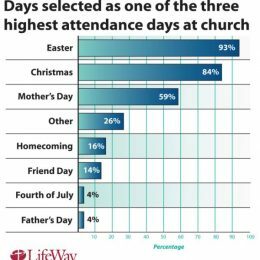 Odds are, most seasonal church goers will opt to attend a later service time, leaving the early services under capacity and the later service times overcrowded. 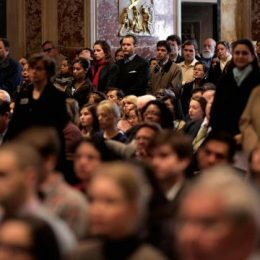 A week or two before the holiday, ask regular congregation members to consider attending an earlier service time to avoid the crowd. When service times run close together it is difficult to turnover service crowds and starts or end services on time. By putting a room divider between your sets of doors and through your vestibule, you can easily direct the previous service’s attendees to exits while providing an easy and smooth path for the next service’s guests to flow into your service space. Live streaming your holiday services online allows you to get your message out to those who cannot attend your service live. This increases your reach around church holidays without affecting your crowd total. Using a free ticket system is an extremely practical way to gauge and control seasonal church crowds. By requiring attendees to reserve tickets for their service time you can guarantee you have enough seats for each guest. Additionally, you can recommend prospective attendees on service availability with complete certainty. If you have an extra gym space or fellowship hall, you can easily set up an overflow seating area. Setting up rows of chairs with a large projector in your extra space creates an extra service area where you can live stream the service to guests who arrive later or are over capacity for the regular service space.